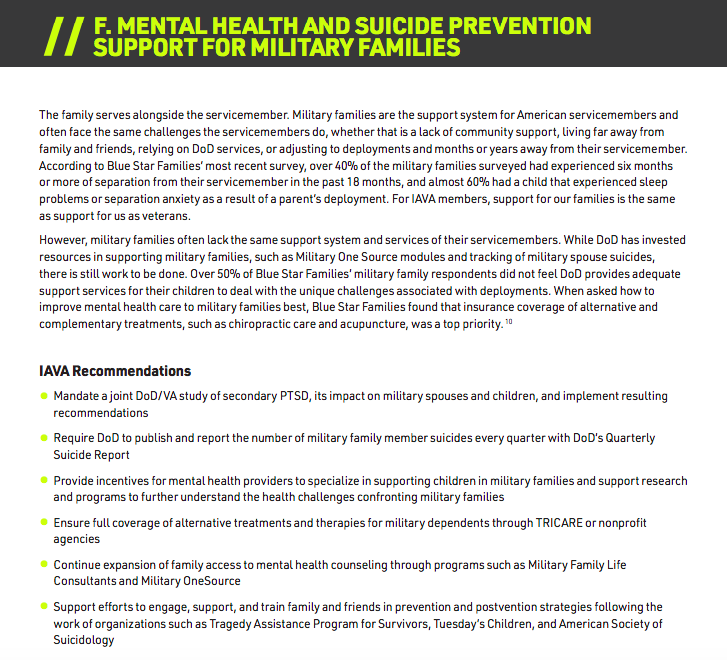 For nearly a decade, IAVA and the veteran community have called for immediate action by our nation’s leaders to appropriately respond to the crisis of 20 military and veterans dying every day from suicide. Thanks to the courage and leadership of veterans, military family members, and our allies, there has been tremendous progress. The issue of veteran suicide is now the subject of national conversation, increased media coverage, a reduction in stigma, and a surge of government and private support. Yet, the problem continues to loom. According to the most recent VA data, the youngest cohort of veterans, post-9/11 veterans aged 18 to 34, have the highest rate of suicide. And while not always an indicator of suicide, mental health injuries continue to impact the post-9/11 generation disproportionately. 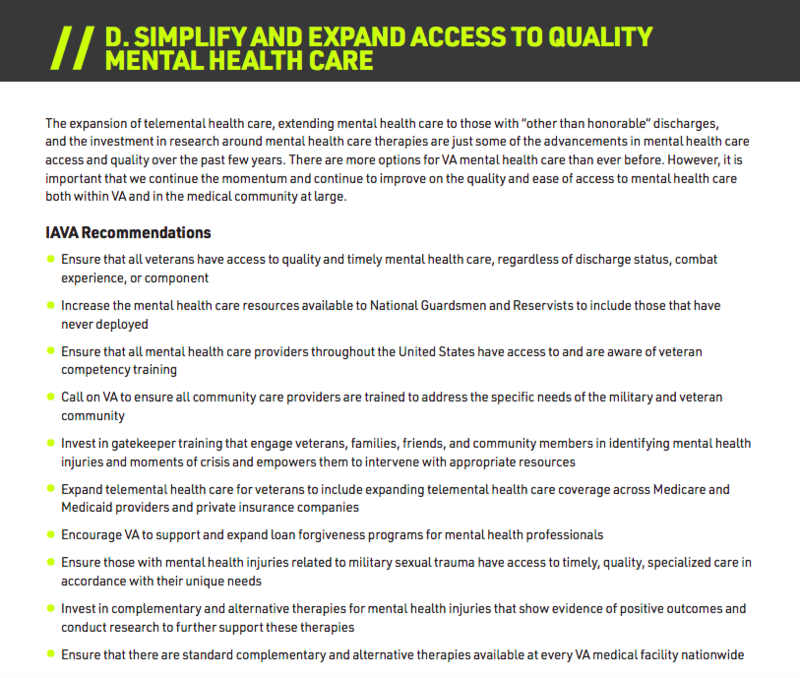 In our latest member survey, a stunning 60% of IAVA members reported service-connected PTSD and over half report anxiety (56%) or depression (53%). Meanwhile, the nation and VA struggle to keep up with the demand for mental health care and mental health care providers such as psychiatrists and psychologists, both of which are in the top 5 for VA staffing shortages. However, there is some progress. Of those with a mental health injury, almost 3 in 4 are seeking care for their injury, according to IAVA members. Over the past few years, much progress has been made in the realm of suicide prevention and mental health. 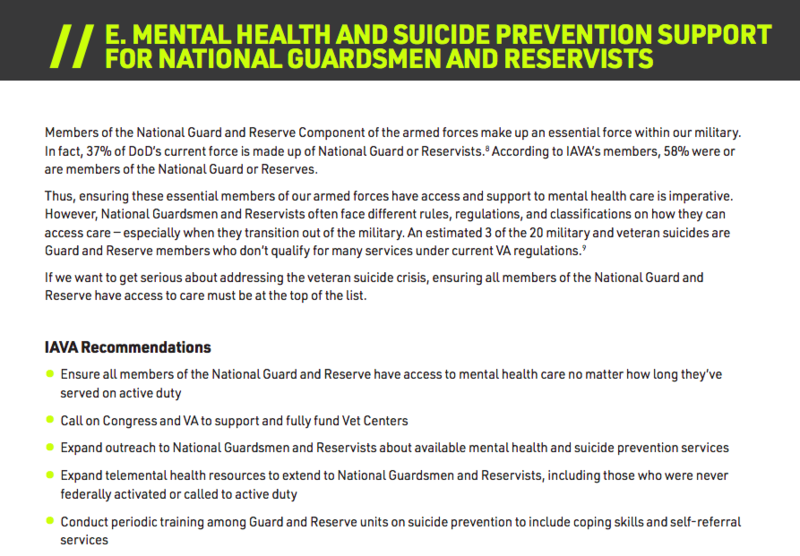 DoD, Department of Homeland Security (DHS), and VA’s plan for transitioning servicemembers targets those in the post-9/11 generation at increased risk of suicide to engage with them before the moment of crisis. VA has leveraged telemental health care to expand its reach and predictive analytics to target the top 0.1% of veterans at risk for suicide. Meanwhile, research into effective treatment options and crisis intervention methods continues. One of the critical ways that IAVA maintains our leadership on this issue is through our Rapid Response Referral Program (RRRP). In 2018, we provided nearly 130 connections to mental health support for veterans and family members around the country, ensuring that those in need of help could easily access the quality support they need. Importantly, we have a memorandum of understanding with the VA’s Veterans Crisis Line (VCL), which allows us to provide a warm handoff with a trained responder at the VCL, where at risk veterans are never left alone or hung up on, literally preventing veteran suicide. In 2018, RRRP connected 39 veterans to the VCL, which means that about every week and a half we connected a veteran who was either showing suicidal tendencies or at risk of suicide with lifesaving support. 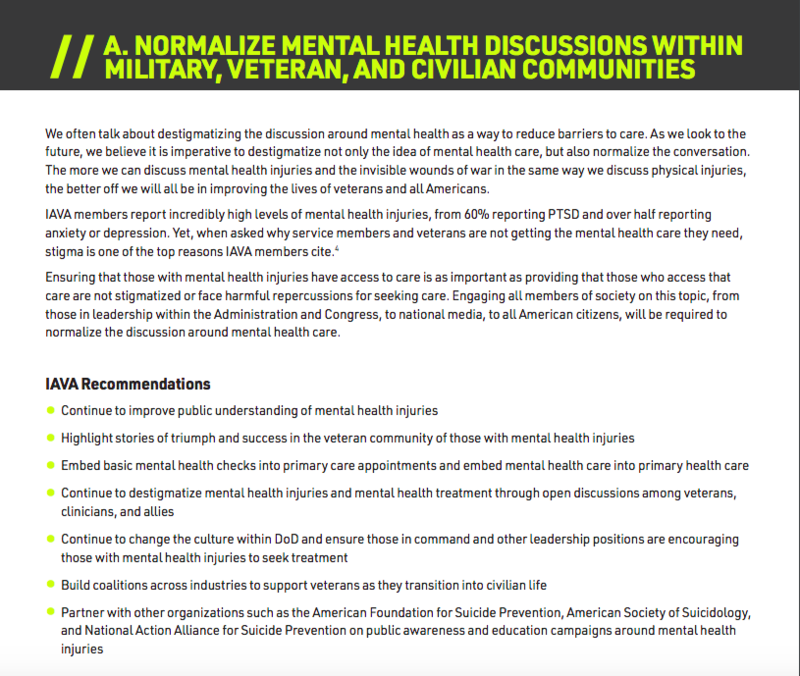 In 2013, IAVA and our partners jump-started a national conversation. But the flood of need continues nationwide – and continues to rise. 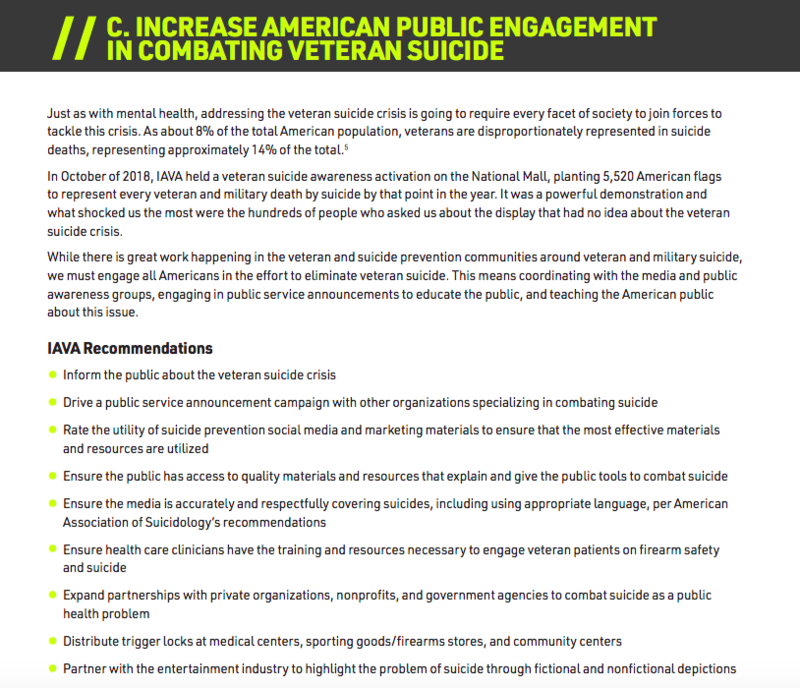 In our latest Member Survey, 65% of IAVA members know a post-9/11 veteran who attempted suicide. 59% know a post-9/11 veteran who died by suicide. Every day, we are losing more of our brothers and sisters to suicide. Now is not the time for America to let up. Instead, this is a time to redouble our efforts as a nation and answer the call to action. IAVA will continue to maintain our leadership on that charge. 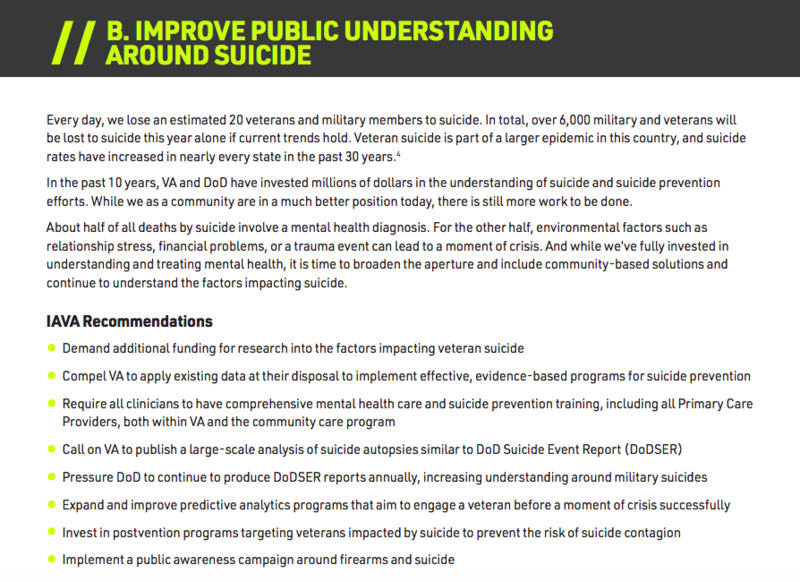 Learn more about IAVA’s campaign to combat suicide here.